Selective coordination and arc flash protection study in electrical design — is it required? This subject has been already discussed in one of my previous articles. However, confusion on this issue does not appear to subside among the electrical designers, and it is appropriate to re-visit this subject again from the perspective of the Canadian Electrical Code, Part I. Is selective coordination of overcurrent protective devices mandated by the CE Code? Is arc flash protection required by specific Rules of the CE Code? Perhaps, now is a good time to elaborate on the essence of selective coordination and arc flash protection. Let’s start with selective coordination. In essence, in selectively coordinated services, feeders or branch circuits, only the overcurrent device directly protecting the overloaded/faulted part of the electrical distribution system will open, thus allowing the rest of the system to operate as designed. 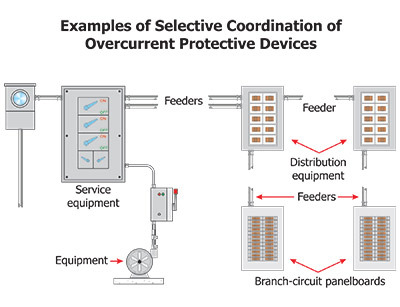 Therefore, the task of choosing the appropriate overcurrent protective devices in branch circuits, feeders and services and their ratings or settings for the purpose of selective coordination is a very important responsibility of the professional during the design stage of the electrical distribution system. Does it mean that a selective coordination between each overcurrent protective device designed for installation in the electrical system is mandated by the CE Code? The answer is “No.” It should be noted that the selective coordination of overcurrent protective devices has nothing to do with electrical safety. It is intended to facilitate performance of the designed electrical system. As the CE Code is the safety standard for installation and maintenance of electrical equipment (and not a design and performance manual), the Code does not place a general (blanket) requirement for the selective coordination of overcurrent protective devices. Thus, in general, selective coordination of overcurrent devices is not the electrical safety criteria of the Code, but rather is a good engineering practice, and such practice should be encouraged in the electrical design. From the safety perspective, the CE Code mandates such selective coordination only for those overcurrent devices that are installed in feeders and branch circuits supplying very particular electrically connected life safety equipment. For example, Rule 32-206(5) requires such selective coordination between the circuit breaker installed in the normal power supply circuit to a fire pump (upstream of a fire pump controller) and the circuit breaker provided integrally with the fire pump controller. This requirement is intended to ascertain that in case of a fault, the overcurrent device provided with the fire pump controller will open the circuit first. Another place in the CE Code where selective coordination between the overcurrent devices is specifically required is Rule 46-208(1). This Rule mandates such selective coordination, as Section 46 covers provisions for installation of electrically connected life safety systems mandated by the National Building Code of Canada, and reliability of operation of this equipment in the event of fire or power loss emergency is paramount. “46-208(1) The overcurrent device for an emergency power supply shall be coordinated with the overcurrent devices of feeders and branch circuits supplying life safety systems and other electrical equipment connected to the emergency power supply in order to provide selective operation of the branch circuit overcurrent device when a fault occurs in that branch circuit”. It is obvious to the CE Code users that from the perspective of life and fire safety, it is essential to provide selective coordination between the main overcurrent device of the emergency generator and the downstream overcurrent devices that protect feeders and circuits supplied from the emergency generator. It should be noted that the NFPA 20 allows connection of the fire pump feeder directly to the emergency generator main emergency bus, ahead of the generator main overcurrent protective device. CSA standard C282 has recognized this fact as well, and Clause 8.7.1 has been recently revised by the technical committee responsible for C282 accordingly. This revision will be shown in the new edition of C282. It looks like we have sufficiently discussed the CE Code requirements for the selective coordination of overcurrent devices and, hopefully, that the extent of such requirements of the Code are clear. 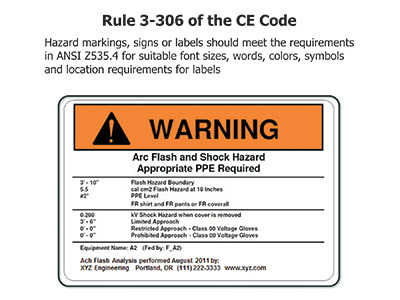 Let’s review what does the CE Code states in respect to the arc flash protection. (1) No repairs or alterations shall be carried out on any live equipment except where complete disconnection of the equipment is not feasible. (2) Three-way or four-way switches shall not be considered as disconnecting means. (3) Adequate precautions, such as locks on circuit breakers or switches, warning notices, sentries, or other equally effective means, shall be taken to prevent electrical equipment from being electrically charged when work is being done”. “Examples of tasks that are not feasible when electrical equipment has been completely disconnected are troubleshooting of control circuits, testing, and diagnostics. It is intended by this Rule that persons performing maintenance, adjustment, servicing, or examination of energized electrical equipment adhere to all applicable safe work practices around the energized electrical equipment. See Section 0 for the definition of Qualified person. However, under no condition, the CE Code mandates arc flash study as the part of safety requirements for electrical installations. Such arc flash study is a stand-alone engineering activity, and this activity is usually undertaken by the electrical engineering professionals upon request from the owners of the facilities where electrical work is expected by the qualified persons on energized electrical equipment. Each such study should take into account fault currents available from all possible sources at every overcurrent protective device and disconnecting means installed at the facility. Arc flash and shock hazard calculations are performed to determine the maximum expected incident energy during a potential arc fault at each specific point. In order to perform these calculations, it is essential to understand how the electrical system is grounded and how the overcurrent protective devices are set and coordinated. A typical arc flash study is performed for the worst case scenario and the determined incident energy levels are divided by categories. These incident energy levels must be made available to the qualified persons for the purpose of accurate selection of necessary personal protective equipment where work on the energized electrical equipment is intended to be performed. As indicated above, the CE Code does not mandate compliance with Z462 during the electrical installations undertaken under provisions of the Code. It simply references this standard in Appendix B Notes on Rules 2-304 and 2-306. (1) Electrical equipment such as switchboards, panelboards, industrial control panels, meter socket enclosures, and motor control centres that are installed in other than dwelling units and are likely to require examination, adjustment, servicing, or maintenance while energized shall be field marked to warn persons of potential electric shock and arc flash hazards. (2) The marking referred to in Subrule (1) shall be located so that it is clearly visible to persons before examination, adjustment, servicing, or maintenance of the equipment”. “CSA Z462 provides assistance in determining the severity of potential exposure, planning safe work practices, and selecting personal protective equipment to protect against shock and arc flash hazards. ANSI/NEMA Z535.4 provides guidelines for the design of safety signs and labels for application to products. IEEE 1584 provides assistance in determining the arc flash hazard distance and incident energy that workers may be exposed to from electrical equipment”. It is interesting to note that choice of the overcurrent protective device, ratings of the devices and selective coordination between them in each particular installation create a direct impact on arc flash calculations and on selection of the personal protective equipment, as the faster the fault is cleared by the overcurrent protective device, the lesser level of the incident energy is generated. Hopefully, this article clarifies some confusion on this important subject. And, as usual, the authority having jurisdiction should be consulted in every particular case of design, as different AHJs might have their specific requirements on this matter.